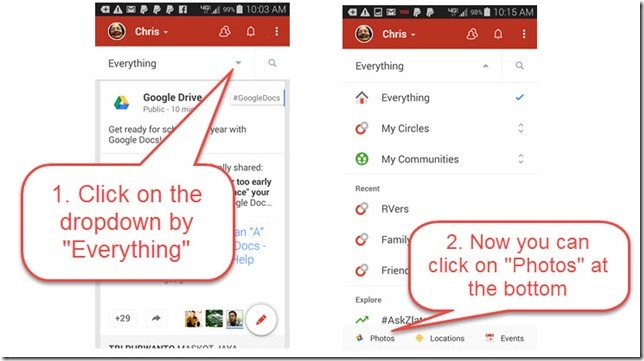 Google+ – Learn Picasa and Google Photos! A few days ago, Google announced the latest incarnation of their online photo storage and sharing service, now called simply, Google Photos. Before I tell you the good and the bad of this announcement, let me give you a little bit of history. In 2006, Google offered an online photo storage and sharing service called Picasa Web Albums (PWA.) It worked in tandem with the Picasa software on computers and it was quite popular. In 2012 Google started the Google+ (Plus) social network and they totally reprogrammed the photo storage and sharing service to integrate it with the social network. They called it Google+ Photos. Picasa Web Albums continued to exist. If you used either of these services, your uploaded photos were stored in the same place, as part of your Google account. 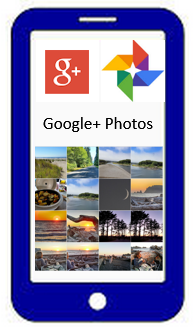 You could work with your photos using either Picasa Web Albums or Google+ Photos. 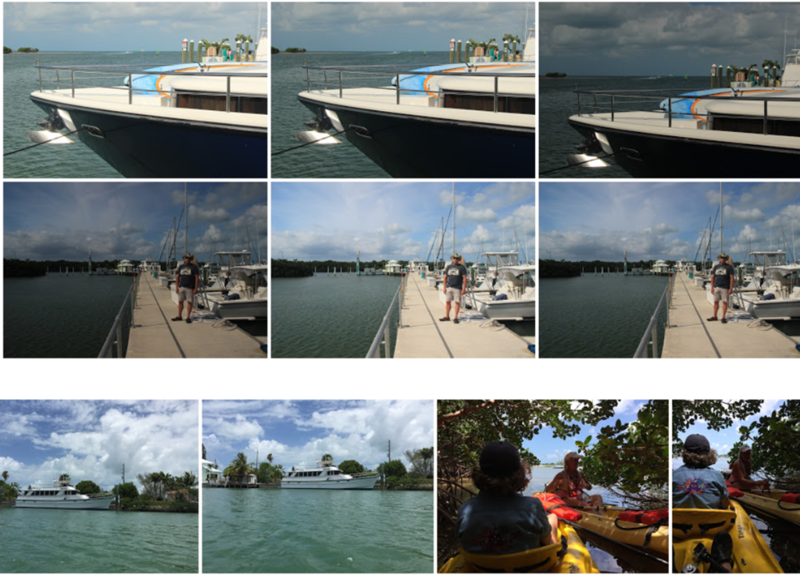 These were simply 2 interfaces to the same set of online photos, but since Google+ photos was newer, it was the default. Unless you used a very specific address to get to PWA (https://picasaweb.google.com/lh/myphotos?noredirect=1) you would be taken to Google+ Photos every time. Now, in 2015, we have a third interface. The Google Photos that was announced this week. Why? Because Google is trying to get it right … and, of course, to hold on to that huge market segment of people who care about their photos! Google learns and evolves. They learned that people didn’t like to be forced into the Google+ social network in order to use the photo storage and sharing service. They learned that we all have way too many photos to manage them ourselves. In response, Google Photos is uncoupled from Google+ and it offers free UNlimited storage for photos in original resolution up to 16 megapixels. …it’s become clear that while social networks are great for sharing images and video clips, they’re not where most people want to store all their private, personal photos and videos. That’s one reason why Google has been hard at work building an entirely new photos experience from the ground up. One that works for the photos you want to share, as well as the ones you don’t. Google Photos is a standalone app for Android and for Apple iOS, as well as a website – photos.google.com. These are all available now, for free. Probably the coolest new feature is found by using the Search feature. Tap the search icon (magnifying glass) in the mobile Apps, or click in the search field on the web. Instantly, you will see your photos categorized by People, Places, Things, and Types. I was amazed to see my pictures grouped under Things: Sky, Mountains, Flowers, Cars, Sunset, Boats, Kayaks, Caves, Camping, Lighthouses, and on and on. If I click (this view is private) on the picture labeled “Boats” I see lots of boat pictures that have collected in my photo library over many years. personal kayaks, to boat docks and more. If you want to see your photos using Google Photos, there is no transfer necessary. It’s the same set of photos that you’ve been uploading all along. The ones uploaded to your Google account. Knowing your Google account is key. If you have more than one Google account, you need to pay attention to how you are logged in. If you want a master library of photos, you need to accumulate them under one account. 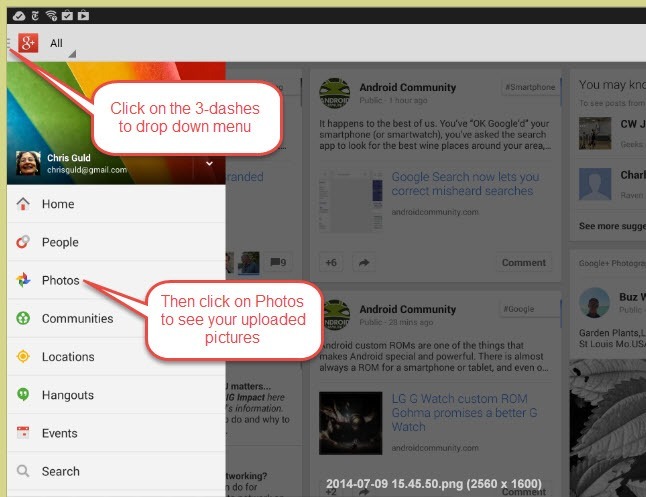 Then you can see them using Google Photos, Google+ Photos, or even Picasa Web Albums. All three interfaces still exist so far. Lots of features are missing. Although it is easy to share pictures via email, facebook, and many other avenues, I see no way to simply make an album public. I am accustomed to giving a link to my photo library and anyone with that link can see all my albums that I have made public. So far, I have not found any command to do that in the new Google Photos. I also see no way, in the iPad app, or the website, to play a slide show of my pictures. The Android App plays a slideshow slick as can be, but you can’t see captions. The editing features that are built-in to Google Photos are very basic. For example, there is no way to add text to a picture, or to retouch a blemish. Picasa Web Albums is still the only interface of the three which offers to make an embeddable slideshow, it is also the only one that offers a way to get prints from your online photos, or view album photos on a map. The Assistant is new and makes it drop-dead simple to create collages, animations, and stories – but if you don’t like what it creates you’re out of luck, no modifications allowed. And, it crashed on me a couple times trying to create Stories and Movies. I expect this will improve over time. If you install either the Android or the Apple iOS App, pay close attention to the default setting to turn on “Backup and Sync.” This is ON by default. 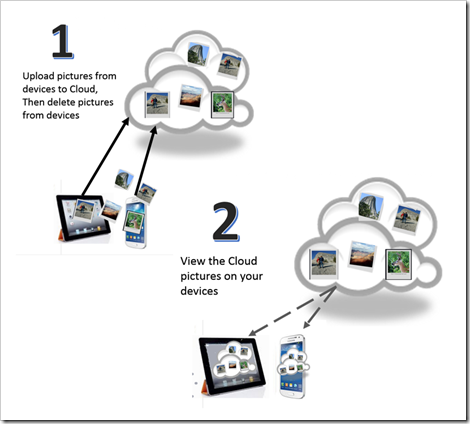 If you leave it that way, you will be transferring ALL photos from that device to the cloud. If those pictures are already there, you may end up with a lot of duplicates. If you pay for your Internet connection, it may get pricey! Although the Apps give you an automatic way to upload every picture taken with your mobile devices to the online photo library, if you’re like me, you still want your master library on your computer and I see no way to do that easily. So I’m still going to use Dropbox to get the pictures from my mobile devices to my computer, then I’ll let Google’s AutoBackup take them from the computer to the online library. What is going to happen to Picasa? They don’t say. I still think that Picasa is the best way to interface between your photo library on your computer, and the one online, so why would Google drop it? But, Google is living in the future, a future where there are no more computers, just mobile devices and online libraries. Even if they did discontinue it, the Picasa that you have on your computer will still keep working, but it will upload pictures at the old, lower resolution rather than the new higher resolution. I expect that they will keep Picasa around for a while to come. They do need to update it just to change that one button that now reads “Share on Google+.” It needs to read, “Upload to Google Photos” and it needs to upload at the higher resolution. When I see that update, I will be confident that Picasa will be around for quite a while. Google Drive can also see the photos in your library. It is showing all recent pictures in folders by month. I like that, but I don’t understand why it is only showing recent photos and an occasional older photo. I had understood that Google Drive would be another interface to the complete library, but it is unknown how this is being implemented. For lots more reading on the new Google Photos, try a Google search for #googlephotos. The video of the actual Google announcement is on this blog post by The Verge. 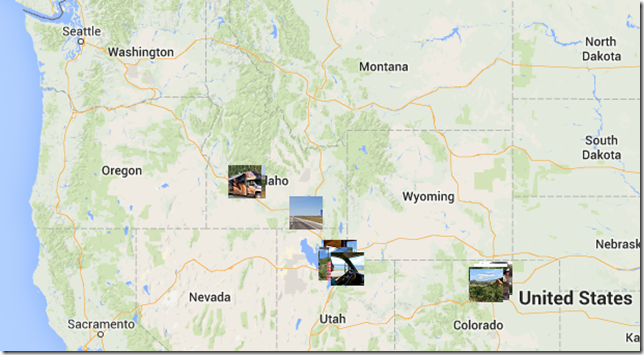 Where are your Web Albums in Google+? 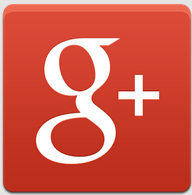 Google+ Comments Off on Where are your Web Albums in Google+? I’ve been using Picasa and Picasa Web Albums for over 10 years. I generally create an album for every month. I’ve also digitized the printed photos from some early trips and created albums for them. Now all those albums are part of Google+ Photos, but where did they go? I see Photos, but I still don’t see my Albums! 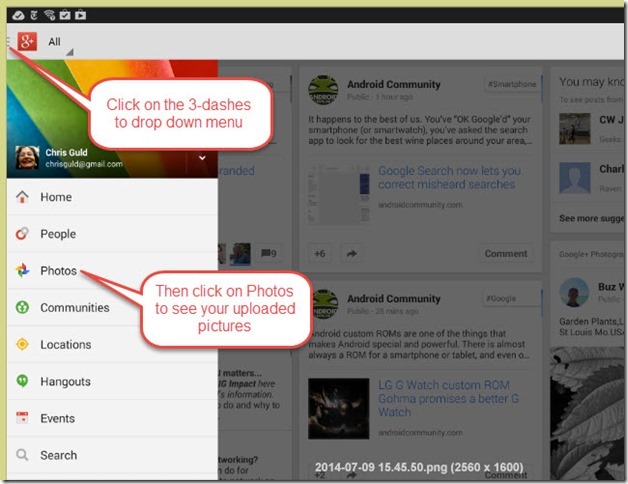 Once you’re looking at your Google+ Photos, you now have another menu – the Photos menu. At first, Google Photos shows you either “All” photos or “Highlights.” To see your Albums, use the menu then choose Albums. As soon as I click on Albums, I will see all of my uploaded albums – even the ones from many years ago, long before Google+. Just keep scrolling down and you’ll see all of yours too. The most recent ones should be at the top and the older ones are there as you scroll down. If you’re confused about the designations of “All Photos” and “Albums” we recommend you watch just 4 minutes of our What Does This Button Do? Show #19, start at position 5:35 and watch for 4 minutes. OR, watch the whole show if you want to learn more. 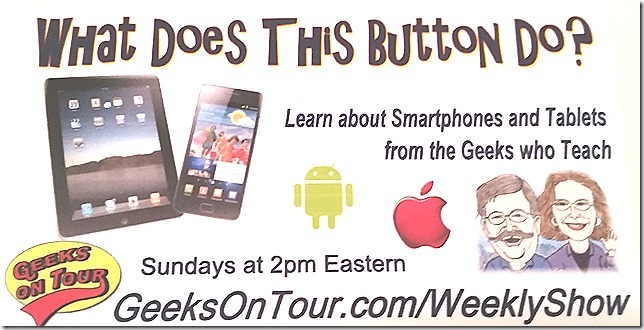 If you are a Geeks on Tour member, we have some prepared tutorial videos. Make sure to watch part 1 even if you don’t have an iPad, it starts out with the explanation of Albums vs All Photos. 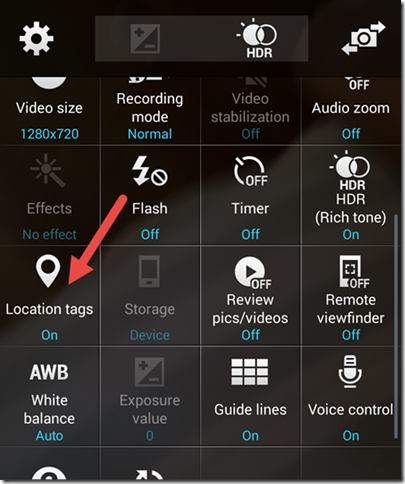 How do I get rid of the Picasa Pictures on my Android Phone? 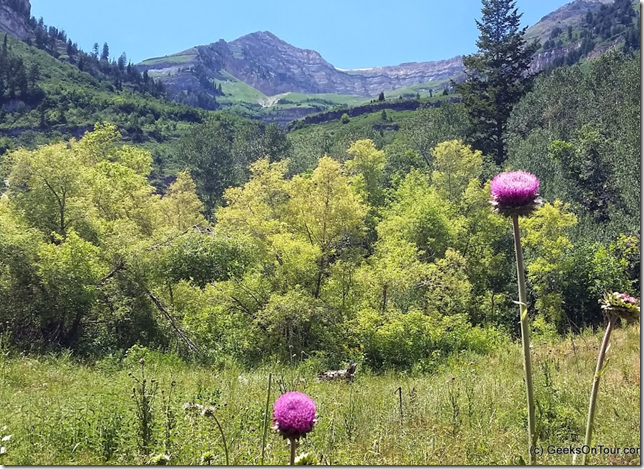 If the gallery on your Samsung Galaxy phone or tablet looks something like the image at right – with all the Picasa logos – you need to read this article. 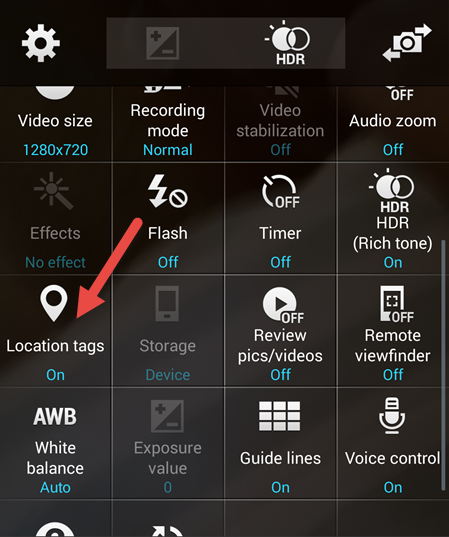 A question I hear all the time these days is “Why do I see so many Picasa pictures in my phone’s gallery, and how do I get rid of them?” If your phone (or tablet) is a Samsung, the answer is very simple. Just tap the 3-dot menu, choose “Content to Display” and Uncheck Picasa. We’ve also demonstrated this in our Quick Tips segment of our Weekly Show. Here’s the tip on turning off Picasa in your Gallery. Picasa isn’t Picasa – Confused yet? You should know that those pictures are still on the Web in your Google account. It is now called Google+ Photos. It is not really “Picasa” since Picasa is software on your computer for managing pictures on your computer. But, because the Web Album portion used to be called Picasa Web Albums and it is a very recognizable logo – that is the icon used to indicate that these pictures are online. So, once you eliminate them from your Gallery, you can still see these pictures by using the Google+ App on your phone or tablet. We dedicated an hour-long “What Does this Button Do?” show on Youtube to learning about Google+ Photos. 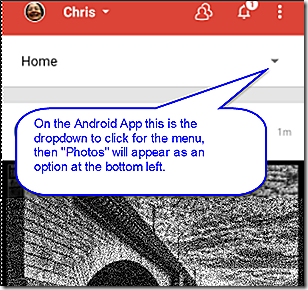 Episode 19: Google+ Photos for Android and iPad. What is Google+ ALL Photos? If you are using Google+ Auto-Backup you may have noticed thousands of pictures in a place Google calls “All Photos.” I think the term “Auto-Backup” is misleading because this is not a true Backup that you can use to Restore to your computer should disaster strikes, it is simply a single-file collection of ALL your photos. 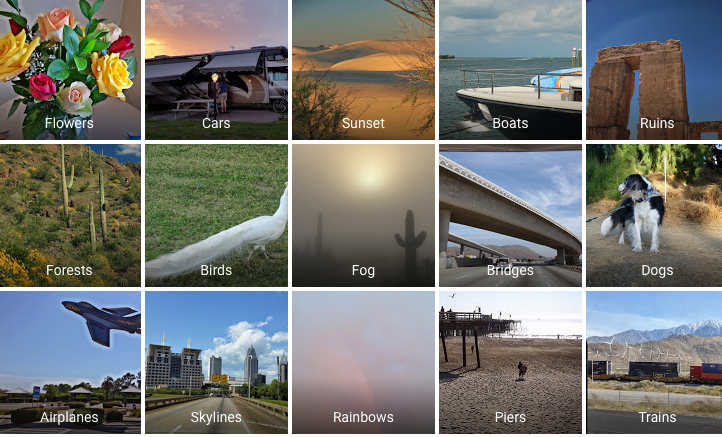 When you first visit your photos in Google+ you will be seeing something called “Highlights.” This is Google’s selection of what it thinks is the most important content from all your photos. It seems to me that they pick about 30% of my photos for this view. In case you have never visited your photos on Google+, the web address is plus.google.com. If you are logged in, you will see a Home menu at the left with a drop-down arrow, click there to see the option for photos. Now you should be looking at something similar to the screenshot above, and you have 3 primary choices on how to view your pictures: 1: the Highlights that Google selects, 2: All photos, or 3: Albums – under the More menu. Albums are those groups of photos that you have intentionally created. All Photos is exactly that … ALL photos. All photos has no organization other than date. Do not try to organize the All photos, and do not try to clean them up. They are visible to only you, and you cannot change that. The only way someone else could see the pictures in the All photos collection would be to log in with your username and password. If disaster should befall your computer, you cannot use this All photos collection to restore your pictures in their original folders. Why? Because there are no folders in All photos. I use All photos for two things: 1: just to browse around by date, sometimes I see a picture I’d forgotten and I really like it – I might copy it out to an Album and 2: to recover individual photos that I have lost or accidentally deleted. If you’re still confused as to the relationship between All photos and Albums, watch this short video. 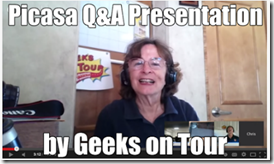 Geeks on Tour is a membership website with hundreds of Tutorial Videos on topics of interest to travelers, such as managing digital photos with Picasa, Route-Planning with Google Maps, and sharing your travels with a website using Blogger or with friends on Facebook. You can subscribe to our free e-newsletters, or become a paid member and be able to view all of the videos in the Learning Library. 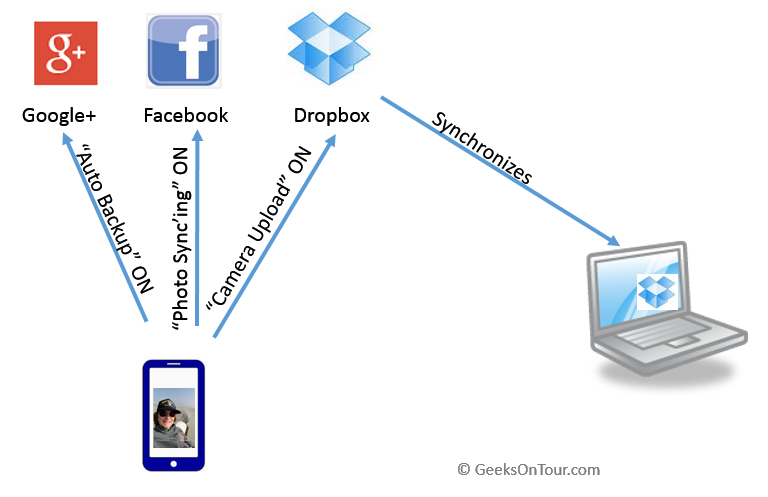 Let’s say you have 3 of the above Apps installed on your iPhone or Android device – Dropbox, Facebook, and Google+. 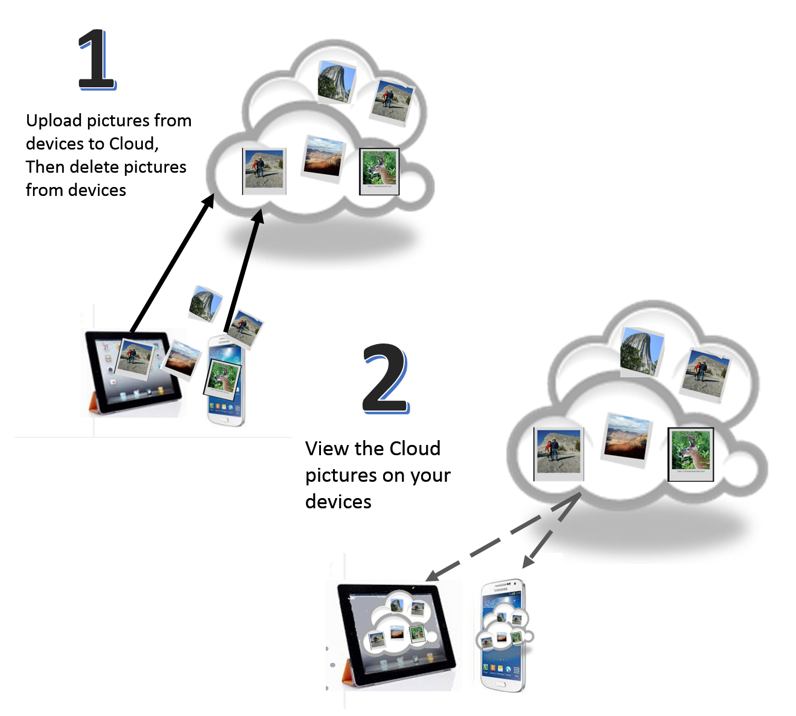 If you turned on the auto-backup feature (either intentionally, or unintentionally) every picture you take is being uploaded to the web 3 times! 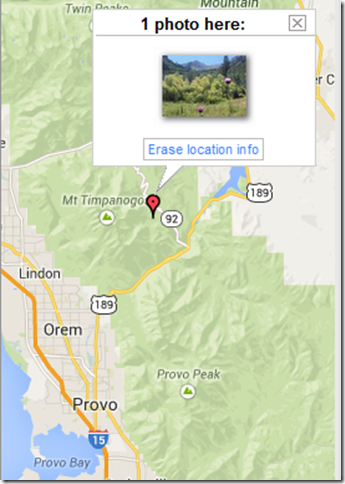 You could see your photos by visiting your Dropbox account, or Facebook, or Google+ Photos. I make sure to have the auto backup feature turned OFF on all but my Dropbox App. 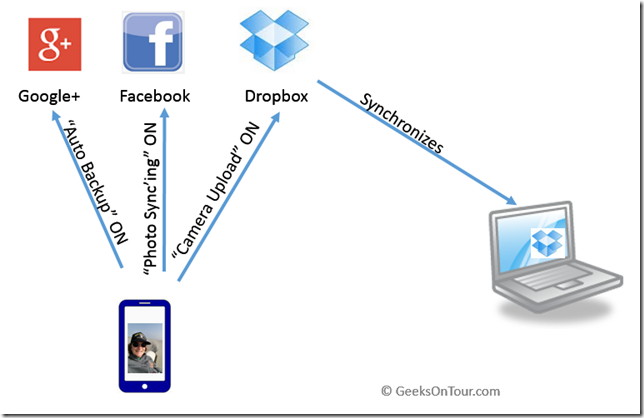 The reason I like Dropbox best is that, after the picture is uploaded to my Dropbox web account, it can also be downloaded to my computer (or any other device) if I have Dropbox installed on that computer or device. I keep the Google+ and Facebook automatic upload features turned OFF, there is no reason to upload my phone’s pictures three times! I do like the Google+ Auto Backup feature to be working on my computer. This way ALL of my pictures are being backed up to my Google+ Photos, not just the ones taken with my phone. Google+ Auto Backup takes care of uploading ALL the pictures on my computer to my Google+ Photos account. Using this method, ALL of my pictures are available to me on my Google+ account. I can now use my phone to access them and show you any picture of mine – even pictures taken with my other cameras. 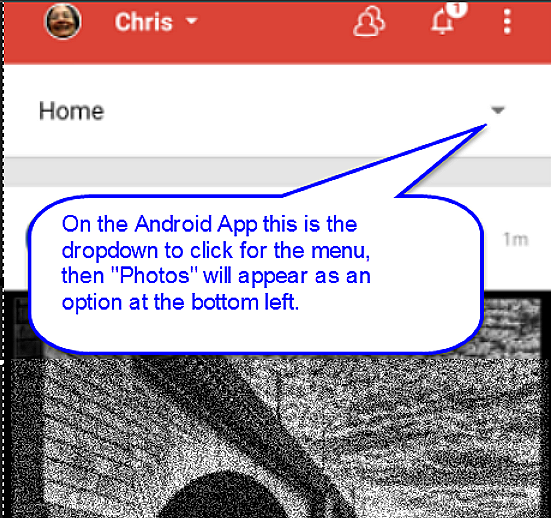 If you’ve been using Picasa Web Albums (PWA) for your online photo albums, you should install the Google+ App on your Apple or Android mobile device. Picasa Web Albums was made and owned by Google you see – they have now updated the technology and re-branded it as Google+ Photos, pronounced Google “Plus” Photos. By uploading your pictures to Google+ Photos OR Picasa Web Albums, and using the Google+ App on your phone or tablet, you will be able to view all the photos from your online albums using your mobile device. People are always pulling out their smartphone to show friends pictures these days, but usually, those pictures are ones they took with that very same smartphone. Using the Google+ App, you’ll be able to show pictures taken with many different cameras if you’ve uploaded them to your Google account using Picasa. 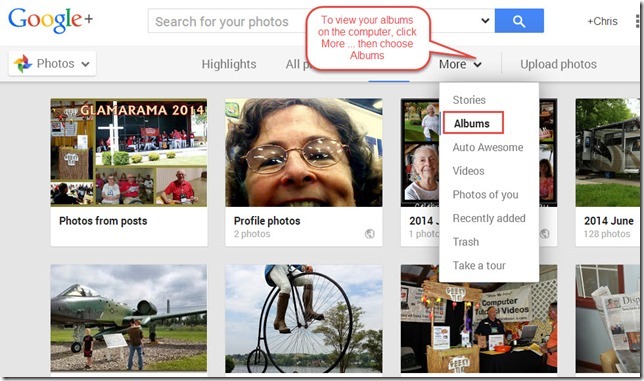 Any photos that you have uploaded to Picasa Web Albums OR Google+, are now viewable on Google+ Photos. 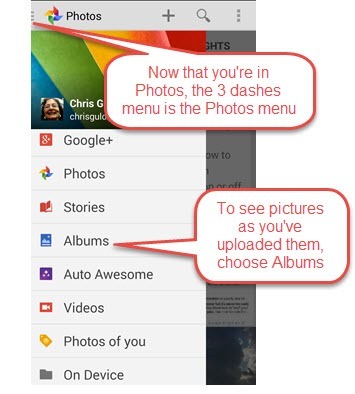 To see your Google+ Photos albums on your smartphone or tablet, you need to install the Google+ App. 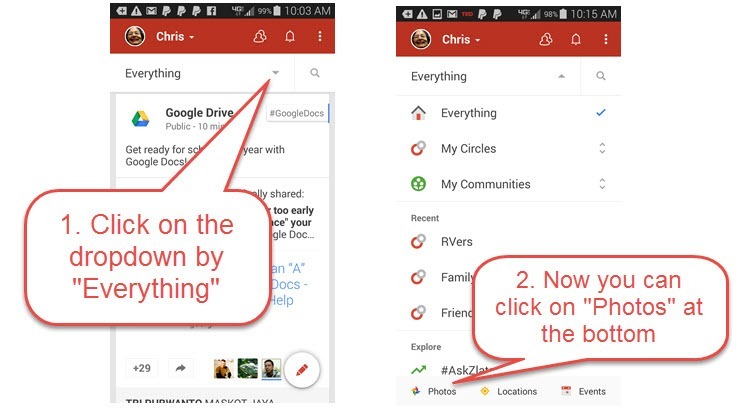 There’s a lot more to Google+ than just photos, so you need to know how to navigate to your photo albums. Photos is just a part of what the Google+ App offers. It includes a social network, and several communication tools (text messaging/phone calling/video teleconferencing), in addition to the photo library. When you first launch Google+ you will looking at the social network – kind of like Facebook. To see your photos, you need to use the menu. On smartphones and tablets, you should see 3 horizontal lines – they may be be very small – in the upper right corner. Click that to reveal the Google+ Menu. If you don’t see the 3 lines, see if your device has a menu button on the device itself. Once you are in the Google+ Photos, there is another menu to let you see All your pictures, Highlights of your pictures, Auto-Awesome pictures (that Google+ created from your pictures) or Albums. If you want to see the pictures you have uploaded, in the way you uploaded them, choose Albums. You will now see, on your mobile device, the same albums that you can see using your computer. On the computer,Albums are under the More menu. Then to see the pictures, click on an Album. Unlimited photo storage for FREE. All you need is to have a Google Account and to agree to upload photos at no more than 2048 pixels. This is the size that Google calls “Best for Sharing.” I have over 26,000 pictures online in my Google+ account, and I don’t pay a penny. Photos are beautifully displayed in a collage-like layout, or with full screen slideshows. Integrated with Picasa software on your computer, so uploading pictures to Google+ Photos is single-click easy. 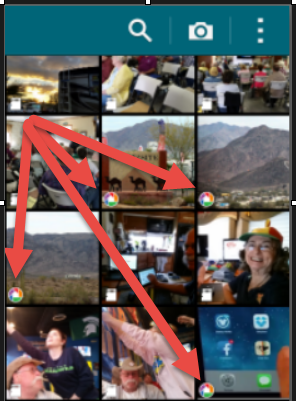 Using the Google+ Photos App, you have your pictures at your fingertips with whatever device is at hand. 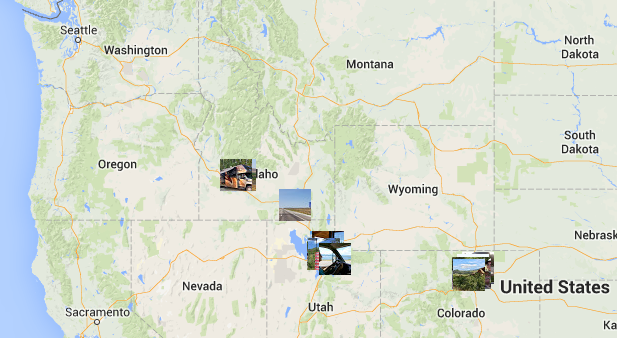 I met some new friends in the RV park last week and they started talking about offbeat places they’ve traveled by RV. I was able to pull up pictures of my choice – a Stonehenge replica on the Columbia River in Washington state – and display them on the phone as I told them about this cool spot. Because I had the Google+ App on my phone, I could easily search my photos for ‘Stonehenge’ and find those pictures from August of 2010. If you’re a photo-holic like me, that’s just priceless!